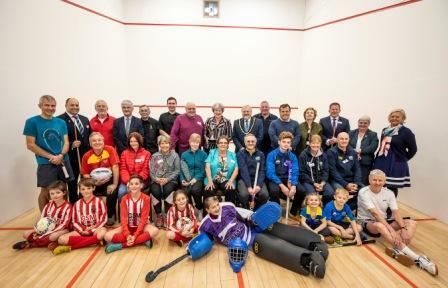 Two newly refurbished squash courts at Berkshire County Sports Club have been officially opened by The Prime Minister The Rt. Hon Theresa May MP, thanks to a cash injection by Wokingham Borough Council as part of its multi-million investment in leisure facilities across the area. To mark the occasion The Rt. Hon Theresa May MP presented the club with the Prime Ministers Cup, which will be used annually to recognise sporting achievements at Berkshire County Sports Club. The courts are available for members of the public to use, from 7am until 10pm, seven days a week and can be booked via the club’s website at: www.berkshirecountysports.club/book-online. Local veterans who play in the Berkshire Veterans League as well as local businesses in the Berkshire Business Leagues all play their competitive matches at Berkshire County Sports Club. During school term-time, Blue Coat use the courts as part of their sports syllabus. The council is investing millions of pounds in leisure facilities right across Wokingham Borough. Earlier this year, the borough council signed a 15-year contract with leisure operator Places Leisure. The contract provides the borough council with an income stream. The new 15-year contract covers Loddon Valley Leisure Centre, Carnival Pool and Fitness Centre, St Crispin’s Sports Centre, and Bulmershe Leisure Centre, as well as the new Arborfield Green Leisure Centre and Ryeish Leisure Centre. As part of the contract, improvements are already well underway. New gym equipment has already been fitted St Crispin’s Sports Centre. Work to refurbish and enhance facilities to increase the choice of sport, fitness and wellbeing pursuits is also well underway at Loddon Valley Leisure Centre. This is on top of two planned brand new replacement facilities at Bulmershe Leisure Centre which is due to open Summer 2020 and Carnival Pool and Fitness Centre in Autumn 2022. 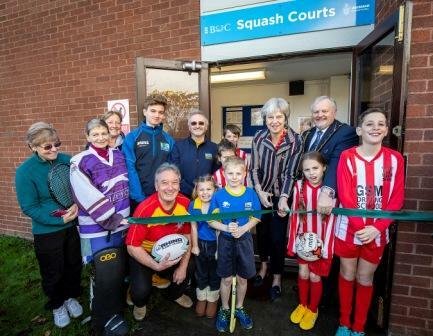 Wokingham Borough Council has invested £35,000 to refurbish the squash courts at Berkshire County Sports Club. The council owns the facility and it is leased to Berkshire County Sports Club. The squash courts are available for members of the public to hire for £8 per court booking; the same price as in other borough facilities. Squash is also available at St Crispin’s Sports Centre in Wokingham, which is managed by Places Leisure.